If you stop and really think about it, the touch screens that adorn most of our gadgets these days are pretty amazing. But could they get even better? 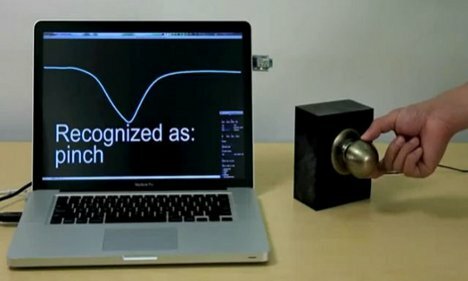 The brainy folks at Disney Research think so, and to prove it they’ve come up with Touché, a touch and gesture sensing technology that could dramatically improve the way we interact with everything around us. Standard touch screens can only sense in a binary manner: they can tell whether they are being touched or not. Touché is far more reactive and can sense different types of touch. 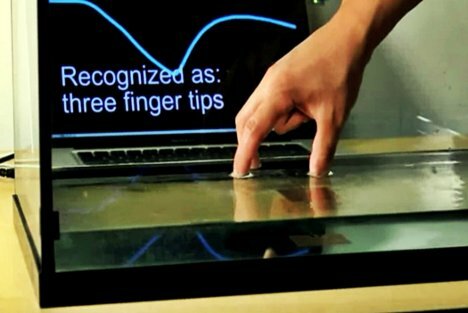 Objects that we interact with every day can be turned into amazingly responsive devices activated by touch. Things as mundane as door handles and sofas equipped with Touché become high-tech interactive objects. The system can even be applied to the human body, as seen in the video below. Even water could enjoy this new sensitivity. The system, applied to a tank of water, could tell the difference between the touch of a single finger and an entire submerged hand. According to the team behind the project, electronic devices are becoming smaller and more ubiquitous all the time, and we need a system like Touché to help us interact with all of those devices in a convenient and novel way.